The Mercoid® Series 3200 Smart Pressure Transmitter is a microprocessor-based high performance transmitter, which has flexible pressure calibration, push button configuration, and programmable using HART® Communication. The Series 3200 is capable of being configured with the zero and span buttons, a field calibrator is not required for configuration. The transmitter software compensates for thermal effects, improving performance. EEPROM stores configuration settings and stores sensor correction coefficients in the event of shutdowns or power loss. 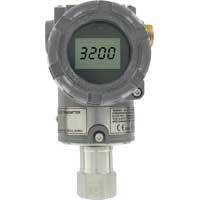 The Series 3200 is FM approved for use in hazardous (Classified) locations. The 100:1 rangeability allows the smart transmitter to be configured to fit any application. Temperature Limits: Process: -40 to 248°F (-40 to 120°C); Ambient: Without LCD -40 to 185°F (-40 to 85°C), With LCD -22 to 176°F (-30 to 80°C). Output Signal: 4 to 20 mA / HART® Communication. Damping Time: 0.25 to 60 seconds. Loop Resistance: Operation: 0 to 1500 Ohm; HART® Communication: 250 to 500 Ohm. Electrical Connection: Two 1/2" female NPT conduit, screw terminal. Process Connections: 1/2" female NPT. Display: Optional: 5 digit LCD. Enclosure Rating: NEMA 4X (IP66) and explosion-proof for Class I, Div I Groups A, B, C and D.
Weight: 5.5 lb (2.5 kg). A-630 - 316SS angle bracket with bolts.